The Cartel 55: In the spirit of the Highland Streetboards philosophy this board gives you extra choice when it comes to finding your perfect ride: all the features of the Highland Cartel 56 in a slightly smaller package. The more comfortable you are while riding the more control and confidence you can bring to your riding so we offer the Cartel in these two size options so everyone can find a board fine tuned to their own style and size. 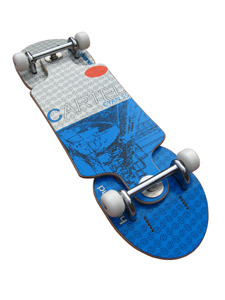 The Highland Streetboards Cartel 55 has the same wide bar as the cartel 56 to lock onto the most difficult slides but with a smaller stance and footplates for personal comfort. Strength is as usual a top feature of this board and our specially sourced Canadian Maple construction means this board is ready for anything leaving you to concentrate on your riding without worries. Mixing this with what we feel is our best graphics to date makes a winning combination to ride anywhere! For the ultimate in Streetboard strength, Style and personal comfort need you look further? Bar = 55cm stance, 26cm wide, 9.7cm wide bar neck, 32.5cm effective edge. Slick. Footplates = 25cm wide 12.5cm long nose/tail on footplates. Slick. All Highland wood parts are 9 ply Canadian maple. Trucks = Polished Mercury / 58mm 95a wheels / Abec 5 bearings. 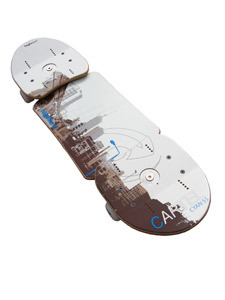 This board comes boxed and assembled ready to ride complete with wheels fitted and griptape cut and ready to stick on! Get your Highland Streetboard today!